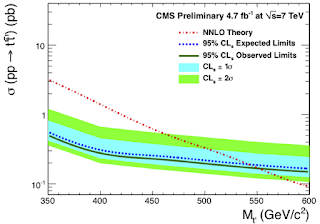 Today the CMS collaboration revealed several new analyses based on the full dataset the LHC collected in 2011. As usually, the recurrent theme was "no-significant-excess-was-found". Here is a selection of the most interesting searches and limits. In this analysis, filed under "4th generation", one looks for a heavier copy of the top quark: a fermionic particle with charge 2/3 produced in pairs and decaying to one b-quark and one W boson. We sort of know by now there is no 4th generation of quarks and leptons in nature, nevertheless this search is relevant to more interesting new physics models. For example, in a large class of little Higgs and composite Higgs models the fermionic partner of the top quark decays as t' → b W about half of the time. The current limit on the t' mass assuming 100% branching fraction for the t' → b W decay is 525 GeV. For little Higgs et al. the limit is slightly weaker, slightly above 400 GeV (due to the smaller branching fraction) but that is also beginning to feel uncomfortable from the point of view of naturalness of these models. This time the target is a heavy cousin of the W boson, decaying to one lepton and one neutrino. Unlike in the former case, there is no compelling theoretical reasons for such a creature to exist. However they represent a characteristic and clean signature that is fairly straightforward to look for: an energetic electron or muon accompanied by missing energy from a neutrino. To tell W' from the ordinary W boson one looks for events with a large transverse mass (for an on-shell particle whose decay products include a neutrino the transverse mass is less than the particle mass). Intriguingly, in the muon channel an outlier event with a very large transverse mass of 2.4 TeV is observed in the data. Of course, most likely it's just a fluke, but in any case it'll be interesting to see what ATLAS has in store. 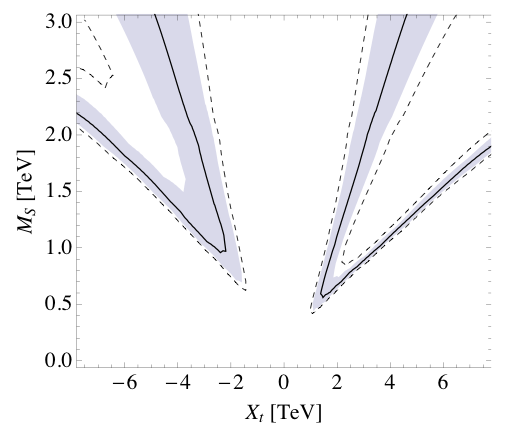 This search targets heavy (more than 1 TeV) particles decaying to a pair of top quarks, a signature very common in models with a new strongly interacting sector, like composite Higgs or the Randall-Sundrum model. Such a particle would produce a bump in the invariant mass spectrum of t-tbar pairs, which are otherwise copiously produced at the LHC. 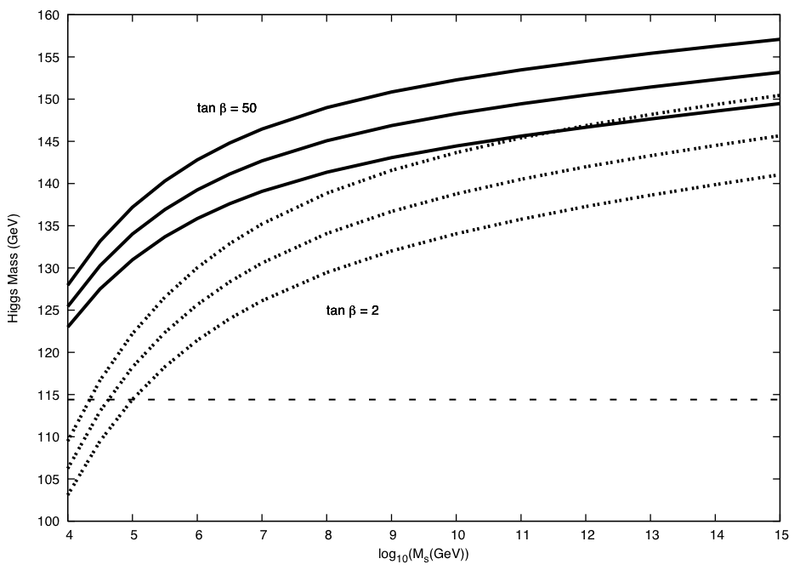 Top quark decays most often to 3 hadronic jets, but for a heavy mother resonance the daughter top quarks move so quickly that their decay products merge into one fat jet. Therefore this search relies on fancy modern techniques of studying substructure of jets, in order to identify closely packed jets that could originate from a fast moving top quark. No resonance is observed in the t-tbar spectrum. 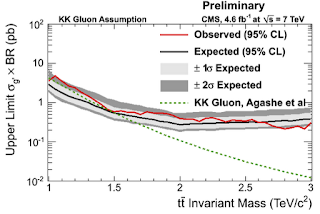 What is interesting is that the LHC sensitivity now reaches the cross sections predicted by popular versions of the Randall-Sundrum model, excluding Kaluza-Klein gluons lighter than about 1.5 TeV. My guess is that the explanation of the Tevatron anomalous top forward-backward asymmetry in terms of heavy KK gluon is now dead and gone. The only vanilla SUSY search updated with the full 2011 dataset is the one in the Z+jets+missing energy channel. This is not the first place you'd look for supersymmetry (that would be jets+MET); this search is relevant to a subset of models where a cascade of neutralinos and gravitons produces, often enough, an shell Z boson. 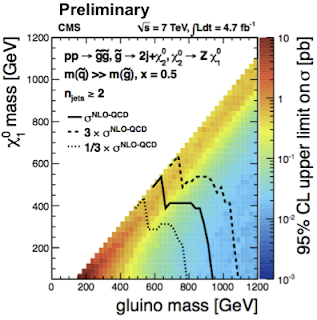 Therefore the limits on the gluino mass are not stunning: 600-900 GeV depending on how squeezed is the SUSY spectrum. More spectacular SUSY limits are probably saved for the Moriond conference in about 1 month from now. 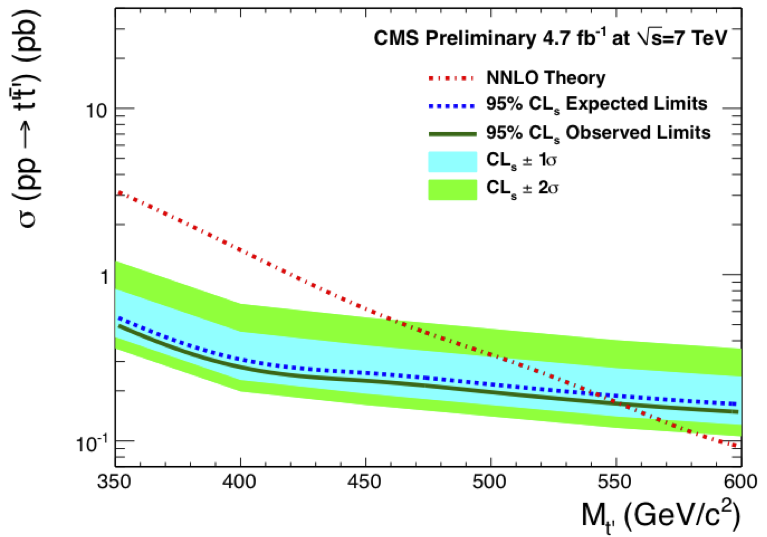 For more details, more models, more limits, and more disappointment have a look at the slides or the original summary notes on the CMS wiki page. At the beginning of 2012, particle physicists are in such a confusing state of mind: Higgs has been practically discovered but we're not allowed to celebrate yet. It's like when your football team is on top of the league, playing in the last round against a relegated team and winning 2:0 after the first half; nothing is decided yet, anything may happen, but... come on... So, to stay sane, most of us act as if the 125 GeV Higgs were a fact and work out the consequences. 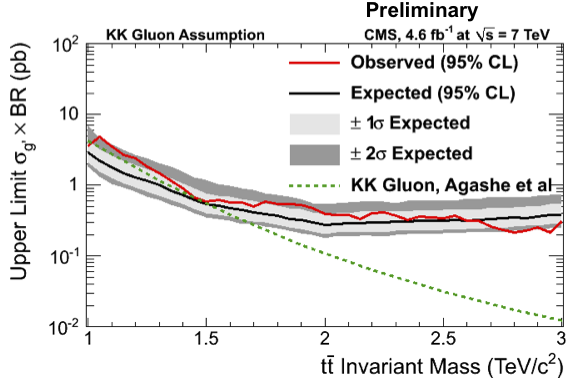 Minimal SUSY without fine-tuning predicts the Higgs mass close to the Z boson mass, that is about 90 GeV. 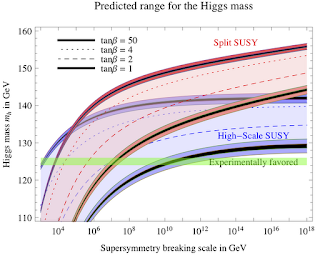 Minimal SUSY ignoring fine-tuning predicts the Higgs boson lighter than 160 GeV. Non-minimal SUSY in general makes no predictions about the Higgs mass. The statement #1 on my list boils down to the fact that in the MSSM the quartic term in the Higgs potential (which fixes the Higgs mass, given its vacuum expectation value) is not a free parameter. Instead, supersymmetry ties the quartic coupling to the electroweak gauge couplings. (for vanishing A-terms, a large tanβ, and universal stop masses, and setting yt=1). In the first approximation one gets the famous bound m_Higgs ≤ m_Z. Thus, if the MSSM were for real, the Higgs should have been seen at LEP. Only when supersymmetry is badly broken, that is when the top mass is much smaller than the mass of its scalar partner the stop, the one-loop logarithmic term can be large enough to raise the Higgs mass considerably above the Z boson mass. In particular, for the 125 GeV Higgs the tree-level and loop contributions must be, amusingly, almost exactly equal. The price for making the stop mass large goes under the name of fine-tuning. Since vacuum equations in the MSSM generically marry the SUSY scale to the weak scale, m_stop ~ m_Z , as soon m_stop >> m_top one needs to carefully tune the parameters of the theory so as to cancel various excessive contributions to the Z boson mass. This goes against the original motivation for supersymmetry which was precisely to exorcise fine-tuning. To wrap up this inflammatory post: the point I was trying to make is that 125 GeV Higgs is not a successful prediction but rather a serious setback from the point of view of SUSY. In non-minimal SUSY any Higgs mass is possible. Minimal SUSY can accommodate any mass up to almost 160 GeV, depending on how much fine-tuning you're willing to accept; 125 GeV Higgs points to 10 TeV squarks, outside the LHC reach. 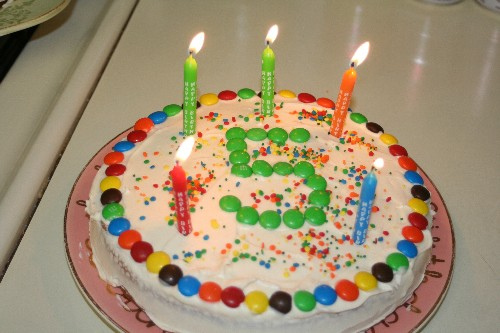 So, here's another candle on my cake. 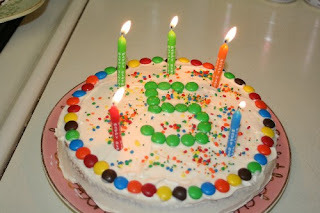 Resonaances has been hanging around the blogosphere for exactly 5 years now, gaining reputation for spreading unfounded rumors, for trying (in vain) to sound funny, and for (successfully) annoying everybody around. 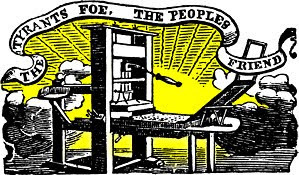 Traditionally, the New Year time is a lazy moment when bloggers take a pause and, rather than chasing news stories, post various summaries and wishlists. From me, as a birthday present, here's a list of 5 important questions in particle physics that likely will be answered by the end of 2012. Is there a Higgs boson and why at 125 GeV? Particle physicists are divided into those who think that Higgs is as good as discovered and those who think one should not say it loud. In any case, 2012 will go down in history books as the discovery year. Moreover, we will start learning something the Higgs couplings, thus kicking off with Higgs precision physics - the subject that will probably dominate particle physics for the next 2 decades. 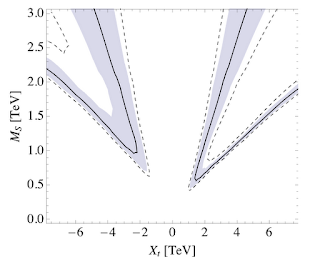 Is there anomalous top quark forward-backward asymmetry? There is this persistent anomaly at the Tevatron: the direction of motion of top quarks is statistically more forward than that of antitop quarks (where forward/backward is the direction of the proton/antiproton beam); the asymmetry is 10-15% larger than predicted by the state-of-art Standard Model calculations. This year we'll get more insight into this phenomenon thanks to analyses of the full Tevatron dataset. Moreover, the LHC will narrow down on the related observable called the charge asymmetry of top pair production, and see whether any discrepancy with the Standard Model appears. If it does, it's gonna be a beautiful year. On the other hand, if nothing unusual is seen by the end of this year, that will be a big blow to our hopes that new physics is lurking there. Is there anomalous CP violation in the B meson sector? Back in 2010 the D0 experiment found in their data the di-muon charge anomaly: a 1% excess of events with 2 negatively charged muons over those with 2 positively charged muons. The most appealing interpretation of that asymmetry was anomalous CP violation in B meson mixing, that is anti-B mesons turning into B-mesons more often than the other way around. However that interpretation is now under serious strain, because no CP violation has been observed by LHCb in the Bs meson decay to J/Ψ ϕ and to J/Ψ f0, and simultaneously no CP violation in the Bd meson sector has been seen in B-factories. 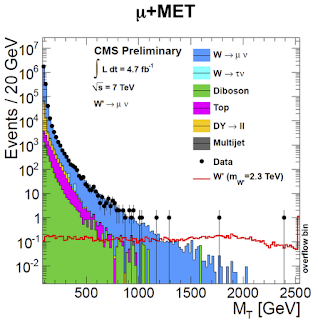 This year LHCb should weigh in with another measurement of the difference of Bd and Bs meson CP asymmetries. That should sweep the floor once and for all, or, hopefully, open Pandora's box. What went wrong in OPERA? Most physicists, including those working for the OPERA collaboration, don't think that neutrinos are superluminal (because of theoretical and indirect experimental arguments). It seems likely that the bug explaining the 60 nanosecond shift of the arrival time of neutrinos sent from CERN to Gran Sasso will be found already this year. The talk in town is that more experimental work will be done soon, with Gran Sasso's experiments ICARUS and Borexino joining in the game with independent measurements of the neutrino speed. Is it the GPS? The clock? A delay in electronics? Or is it the magic mountain? Is there supersymmetry below the TeV scale? SPOILER ALERT: No. Well, so far we know for sure it's not there in its most popular incarnation, with gluino and squarks decaying via short cascades to much lighter stable neutralinos, thus producing a lot of missing energy. This year the net will be made much tighter, thanks to more data, the collision energy (likely) increased to 8 TeV, and many new analyses targeting more stealthy SUSY scenarios. By the end of this year surviving scenarios with squarks and gluinos below TeV will become collector's items, cherished for their rarity rather than beauty. Will there be an Armageddon on December 21? Not sure about it, but definitely the LHC should not be running on that day. So that, if the world ends, they won't blame us.